However, look at the mess. Does your cutting table look like this at times? It will take a good day to decide what to do with all this mess. It all belongs in scrap quilts, but that won’t happen right away, so I need to decide how to store them until they end up in a quilt. Gotta say, my cutting table looks worse, lol. 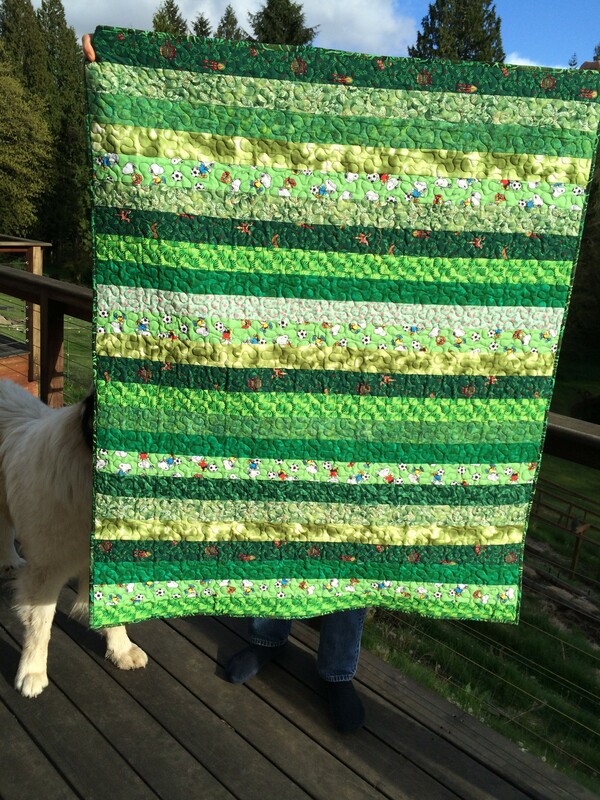 Love your green strip quilt, glad I don’t need to choose between blocks and strips. What a pretty little quilt. I store my scraps in bins by size so I can just pull out the size I want to work with in a quilt. Thank you. But what happens when you keep changing your mind or doesn’t that happen to you? Mine are stored in bins by sizes as well, but then I get surprised when I find some I forgot about. Then I pull all sorts of them out deciding what to use – and then I have the big mess on the table which will sit there until we have rain again. What a sweet little finish! Strip quilts are so nice and easy. I’ve got one that needs to be quilted once I find a backing.